Shopping for men can be difficult but this gift guide for men is sure to relieve some stress. You’ll find products for all budgets & stocking stuffer ideas. Happy Wednesday friends! We are back with another gift guide — today we are talking all about the guys! 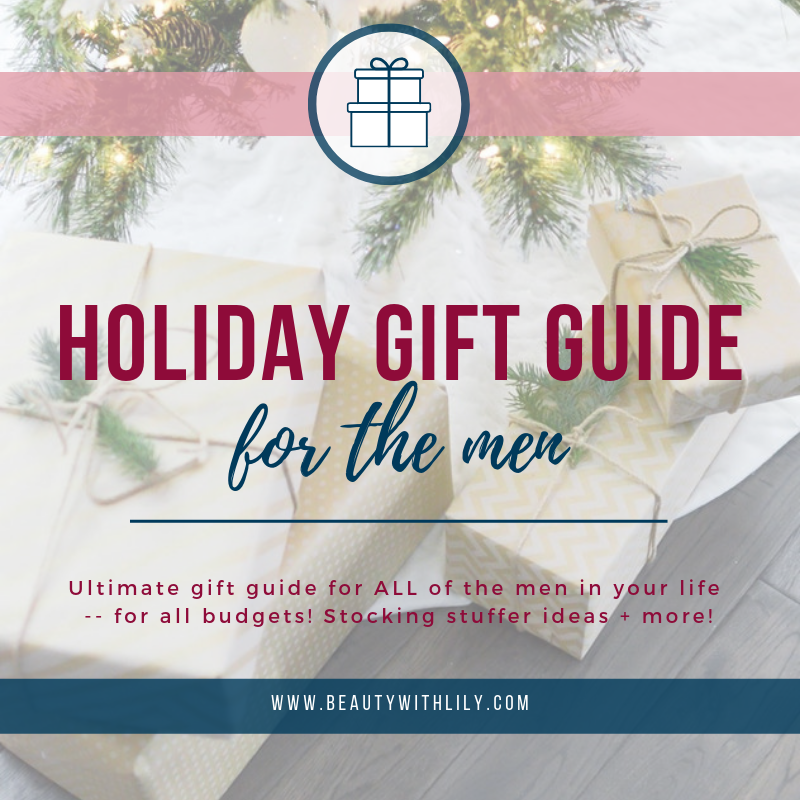 I find it rather hard to shop for guys, I know some people don’t, but for those that do, I have rounded up TONS of great gift ideas. Perfect for all budgets! Let’s dive in, it’s a long one today. You’ll find gifts for guys that are over $150, along with ideas that fit other budgets — and even stocking stuffer ideas! I tried to find products that could fit most guys styles/hobbies — so you have plenty of choices here. If you have someone in your life that travels often, or someone that carries their laptop to and fro a lot, then this anti-theft backpack is a MUST — such a neat thing! For the guy that loves to watch movies, consider getting him an outdoor projector, such a fun item! I know an electric toothbrush doesn’t sound like a fun thing to gift, but trust me, there are certain guys out there that would love this — for instance, I know one of my brothers would be thrilled to get this. If you haven’t given this cologne a sniff, next time you’re at a department store do it, it smells amazing and worth every penny! If you have a guy in your life that loves to make their own craft beer, a craft beer tasting flight, is a good gift idea for them. And for the outdoorsy man in your life, this portable grill is a must — I’m thinking my husband would love this as well. Now if you’re really stuck on something and you know they love video games, you can’t go wrong with the newest Madden video game, or the latest hit. Most guys love boxing or UFC, or maybe they box, consider gifting them a pair of boxing mitts — and they are super inexpensive! Something that’s really neat, is this Bluetooth beanie, perfect gift for a guy that runs in the cold or likes to hike, etc. For the traveler in your life, this support travel pillow is perfect! Now for the stocking stuffers! An NFL beanie will be great for any guy that loves football, and you can’t go wrong with a toiletry set for traveling. And this collapsible water bottle is so neat! I know my husband loses his earphones all the time, so an inexpensive pair of earphones would make a great stocking stuffer. Whew! If you made if thru all of that, thank you! And I hope you found some items to buy the men in your life! Do you think it’s hard to shop for men?